Ye of long legs, take note: though the Knee Defender can't increase the amount of space you have within your sphere of airplane seat misery, it can prevent further reduction of the already minimal square footage. 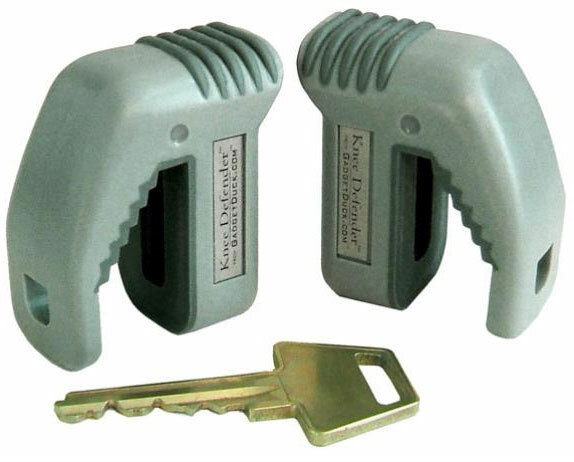 Comprised of two small, inconspicuous clips that attach to open tray tables, the Knee Defender will prevent the person in front of you from reclining his or her seat. And nope, FAA guidelines do not prohibit its use. 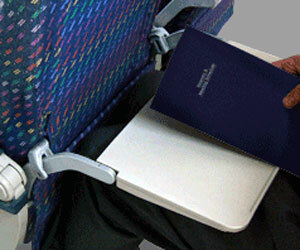 Knee Defenders slide onto any point along tray tables' metal arms to limit or eliminate entirely the encroaching movement of the seat they're connected to. Sure, tall people could take the high road and simply ask their neighbors not to recline, but A) that would require speaking to their neighbors and B) the success rate of this tactic probably falls somewhere in the 10% range, so why waste the breath? Statistics show that most people on airplanes are cranky SOBs unwilling to demonstrate goodwill toward men, even if they aren't cranky SOBs unwilling to demonstrate goodwill toward men in any other arena of life. Shockingly, there's something about the nickel-and-diming airline industry and the gross discomforts of flying that bring out the worst in all of us. 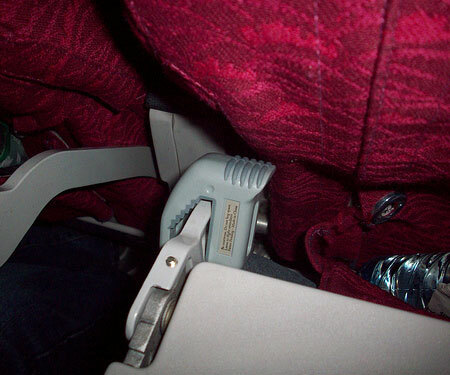 For people who sit through cross-country flights with crushed knee caps or exit their 767 unaware they have just acquired life-threatening deep vein thrombosis, the Knee Defender may be the only way to achieve some solace and alleviate at least one anti-amenity of coach class. But, you protest, what about the people who get Knee Defendered and can't recline their seats? That's no fair to them! Perhaps. And if you feel that way, please also feel free to worry about and accommodate such people. I operate under a policy of Every Man for Himself, so they are way less of a concern to me than, say, me. My Knee Defenders shipped yesterday. Suggested via Dude Product Tips by Robert S. Muchas danke, Robert.